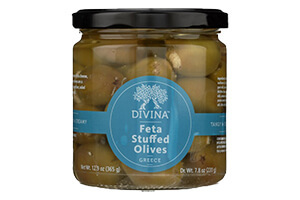 A real Greek combination, meaty, buttery Halkidiki olives filled with smooth, creamy Feta cheese. Divina works with the finest small farms and artisans throughout the Mediterranean to bring you authentic products of exceptional quality. Their olives, from classic Kalamatas to specialty varietals like Lucques and Picholines, bring real excitement to your olive bars. Unrivaled in quality, taste and diversity, the olives are handpicked, hand-sorted and cured using an all-natural fermentation process that fully preserves their natural flavor. All of Divina's products are all-natural, minimally processed and carefully prepared. Mount Athos or Agion Oros, as it is locally known occupies the best part of the Athos peninsula in , a rugged, sea-battered peninsula 56 kilometers long and holds the oldest surviving monastic community in the world. Because of it's isolation Mount Athos has remained one of the most unspoiled parts of Greece. Ingredients:Halkidiki green olives, sunflower oil, feta cheese (sheep and goat milk, animal rennet, salt), mizithra cheese (whey, sheep and goat milk, animal rennet, salt), modified potato starch, spices, sea salt, citric acid (acidity regulator).